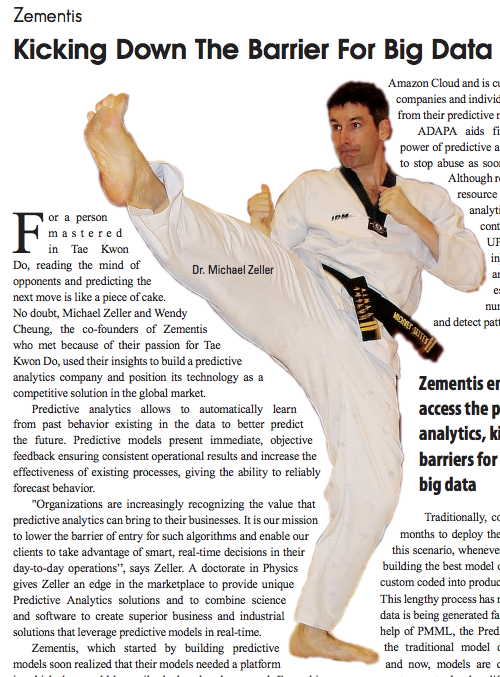 Selected by a distinguished panel comprising of CEOs, CIOs, VCs, industry analysts and the editorial board of CIO Review, Zementis has been named by CIO Review as one of the "Top 20 Most Promising Big Data Companies in 2013." Congratulations Zementis! That comes as no surprise since Zementis is all about kicking down barriers for the fast deployment and execution of predictive solutions. By leveraging the PMML (Predictive Model Markup Language) standard, Zementis' products allow for predictive models built anywhere (IBM SPSS, KXEN, KNIME R, SAS, ...) to be deployed right-away on-site, in the cloud (Amazon, IBM, FICO), in-database (Pivotal/Greenplum, SAP Sybase IQ, IBM PureData for Analytics/Netezza, Teradata and Teradata Aster) or in Hadoop (Hive or Datameer). Predictive analytics has been used for many years to learn patterns from historical data to literally predict the future. Well known techniques include neural networks, decision trees, and regression models. Although these techniques have been applied to a myriad of problems, the advent of big data, cost-efficient processing power, and open standards have propelled predictive analytics to new heights. Big data involves large amounts of structured and unstructured data that are captured from people (e.g., on-line transactions, tweets, ... ) as well as sensors (e.g., GPS signals in mobile devices). With big data, companies can now start to assemble a 360 degree view of their customers and processes. Luckily, powerful and cost-efficient computing platforms such as the cloud and Hadoop are here to address the processing requirements imposed by the combination of big data and predictive analytics. Creating predictive solutions is just part of the equation. Once built, they need to be transitioned to the operational environment where they are actually put to use. In the agile world we live today, the Predictive Model Markup Language (PMML) delivers the necessary representational power for solutions to be quickly and easily exchanged between systems, allowing for predictions to move at the speed of business. Zementis' PMML-based products: ADAPA for real-time scoring and UPPI for big data scoring, are designed from the ground up to deliver the agility necessary for models to be easily deployed in a variety of platforms and to be put to work right-away. 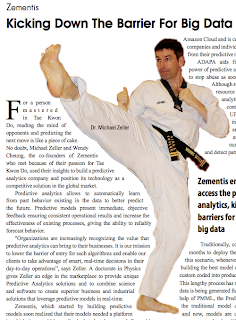 Zementis ADAPA and UPPI kick-down the barriers for big data adoption!